HONG KONG, 5th August, 2013 – The South China Morning Post announced today the official launch of the Spirit of Hong Kong Awards, a key programme within their extensive Celebrating Hong Kong campaign this year. The Spirit of Hong Kong Awards, sponsored by Sino Group, seeks to give recognition to ordinary Hong Kong people who have done extraordinary things. Through actions which demonstrate great integrity, inspiration or which have a positive impact on others in the community, these individuals or groups of individuals exemplify the very best of the Hong Kong spirit. Through The Spirit of Hong Kong editorial series, the South China Morning Post are covering stories of the kindhearted, the honest, the caring and the selfless. Stories such as the tenacious and hardworking individuals who defy seemingly insurmountable physical challenges to achieve their goals will form the foundation of the nominees for the Spirit of Hong Kong Awards in November this year. A total of ten awardees will be recognised by an esteemed panel of judges, with the same criteria of impact, integrity and inspiration. An 11th award will be given to the nominee who wins by popular vote. Nomination and voting can be accessed on the official website http://spirit.celebratinghk.com/, along with highlights some of the top stories published by the newspaper. The Spirit of Hong Kong Awards judging panel is chaired by former Chief Secretary and Acting Governor of Hong Kong, Sir David Akers Jones. The panel comprises eight judges; including former LegCo member and former Chairman of Hong Kong Exchanges and Clearing, the Hon. Ronald Arculli, GBM, CVO, GBS, OBE, JP; Professor Nelson Chow, Hon. Professor at the Department Social Work and Social Administration at Hong Kong University, James Blake, GBS, OBE, JP, former Chief Officer of the KCRC,, Shelley Lee Lai Kuen, GBS, OBE, JP, former Permanent Secretary of Home Affairs and Golden Bauhinia Star awardee for her continuing care of the needy, Dr. Rebecca Lee Lok Sze, Polar scientist and the world’s first woman explorer to reach the Arctic, the Antarctica and Mount Everest region, Daryl Ng, Executive Director, Sino Group, plus SCMP’s Group Chairman Dr David Pang and Editor-in-chief Wang Xiangwei complete the eight. 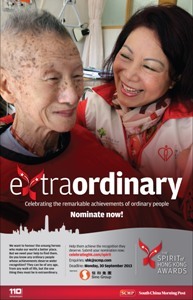 To nominate an unsung hero, please visit http://spirit.celebratinghk.com/. The nomination period closes 30th September 2013.